Maharshi Jaimini gave a wonderful philosophy to the world which is known as Jaimini ‘Upadesh Sutram’. This Sutram contains the shlokas in Sanskrit about Astrology which have very deep and mystic meaning. These sutras have so deep meaning that it is very difficult for an ordinary literate person or astrologer to understand their meanings. But for the convenience of the readers and for their easy understanding, this book is written in such an easy language that even a layman could understand it property and without any difficulty. 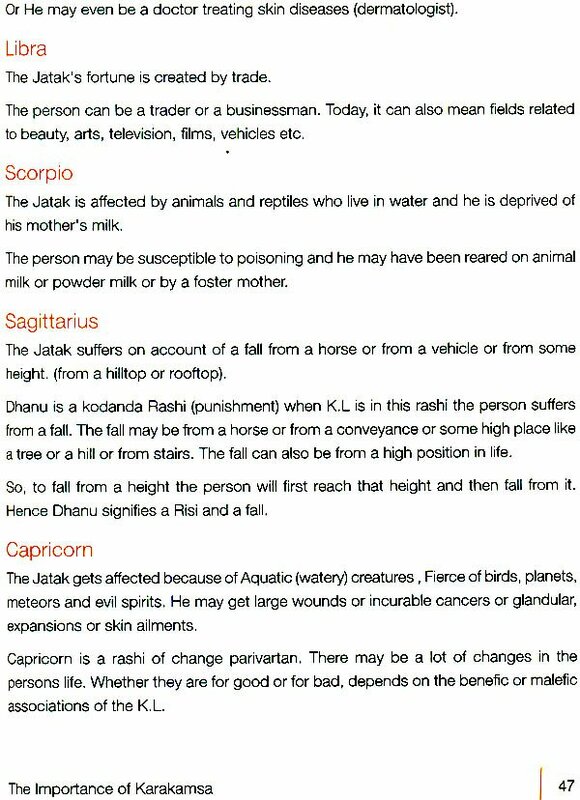 Generally astrologers use Jaimini system for the calculation of longevity. But this book is written not only for calculating longevity but also to enable the readers to learn how to predict taking into account the Jaimini system. This work has been wonderfully and skillfully done by Shri Mahadev Pathak in his celebrated book ‘Jatak Tatvam’. More often than not in most of the astrological texts, the negative aspect of the people has been given precedence in predictive astrology. But the modern astrologers should always try to give importance in taking out the positive aspect of the people while making prediction. This book has been written by all India Federation of Astrologers’ Societies taking into account the course curriculum prevailing in our institutions. Besides that this book will prove quite beneficial to those students also who are interested in learning Jaimini System. Most Astrologers are reluctant to use Jaimini System because they are under the impression that Jaimini is very difficult, and their fears are not totally unfounded. For this reason I am making an attempt to simplify this system, especially for the students of “All India federation of Astrologers’ Societies”. If I am able to succeed in developing their interest in Jaimini, I shall feel rewarded. I will be mainly following the method developed by Shri K.N. Rao. At the same time, I will also be including principles given in other famous treatises on Jaimini Astrology. As I am just a child where Astrology is concerned, I am trying to Avoid commenting on topics on which there and controversies among the Astrologers. I am grateful to Shri Arun Bansal, The President, and Smt Abha Bansal, The treasurer, of All India federation of Astrologers’ Societies for giving me this opportunity to contribute my drop in the ocean of Astrology. Before starting this little book. I seek Blessings of my Divine Guru” Lord Dakshina Moorti”, with whose grace I have learnt Astrology. 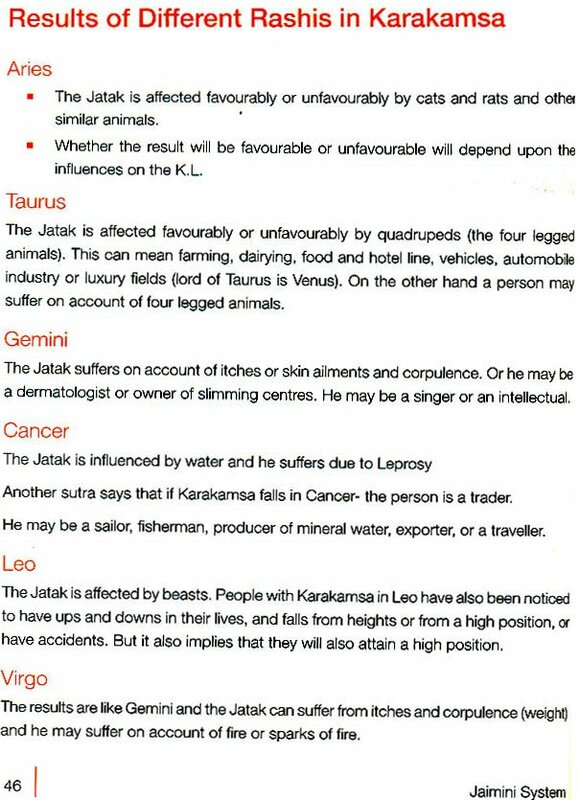 Second to ‘PARASHAR; JAIMINI’ is the greatest giant of Vedic Astrology. Parashar laid down the great principle of Vedic Astrology, while Jaimini went a step further and refined them. “JAIMINI UPDESH SUTRAS” were composed by Maharishi Jaimini. “SUTRAS” are very short Sanskrit Stanzas with very vast and profound meaning. They are like a ball of thread. The more they are opened out, the more meaning they reveal, and they are so brief that they can even be memorized. Who was Jaimini Maharishi? No one knows for sure! Some learned men think that he was a disciple of the famous Maharishi Ved Vyas, who was Parashar’s Son. They also feel that he is the famous author of ‘Poorva Mimansa’ and Jaimini Bharat’. Others feel that he is a later author who was very familiar with mantras. Who ever he was! His genious is reflected in the sutras he composed. These sutras are probably five thousand years old. They have stood the test of time and time has turned them into beautiful Gems of prediction. The centuries have proved their authenticity and soundness. These sutras are 936 in number, spread over four Adhyayas. 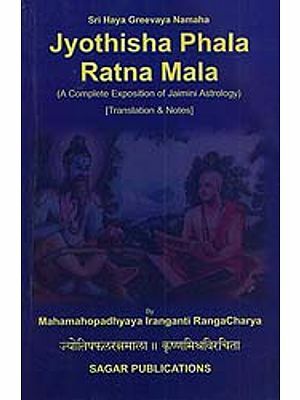 The Greatest principle of Jaimini System is that the Study of Lagna is not enough. 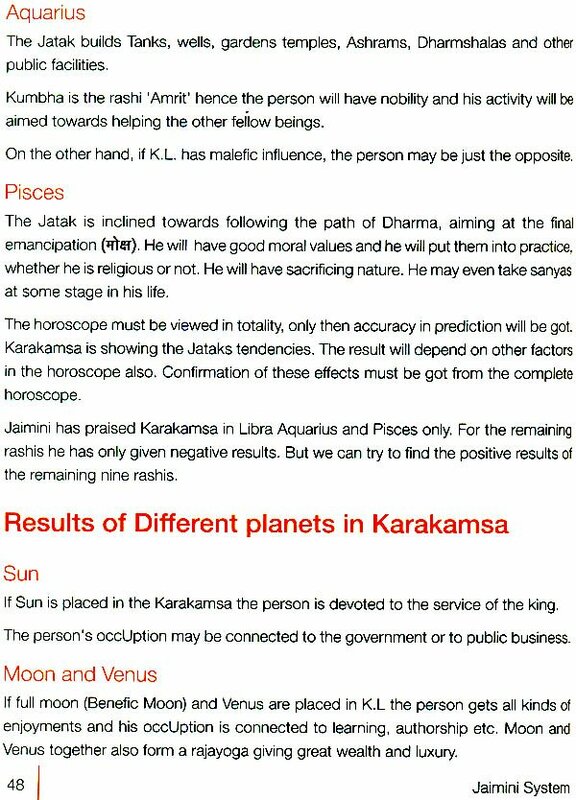 Apart from, studying the horoscope from the regular Lagna, Moon and Sun; one must study it in the light of karakamsa Lagna, Arudha, Up-pada, Hora lagna and the different karakas. In this way the personality of the Jatak is split up into its fundamentals and studied. Next come the karakatvas of the planets and houses. Parashar allotted permanent karakatvas to planets and houses. He also gave conditional karakatvas to the planets according to their lordship over different houses. 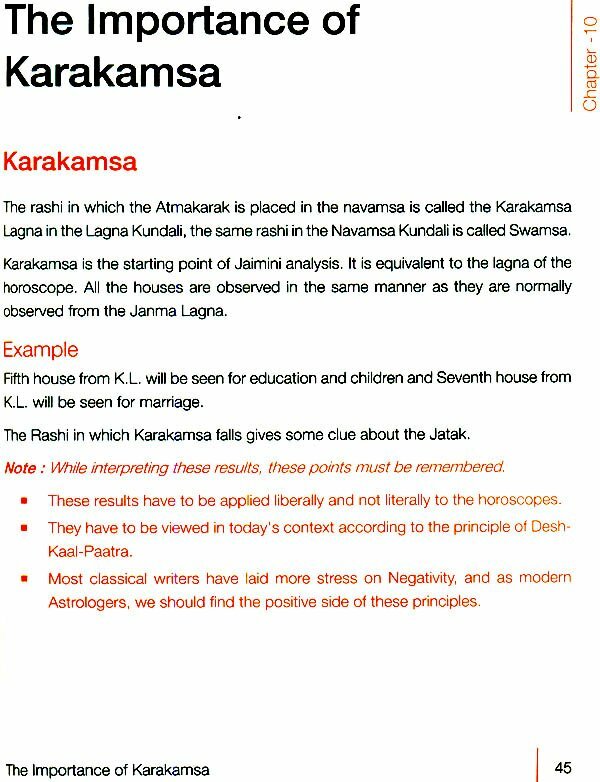 Jaimini made prediction simpler, sharper and quicker by establishing limits of these karakatvas through the different Another striking feature Jaimini is the Jaimini Drishti or Aspects. Every student of Astrology knows that both planets and Rashis affect us and yet we consider the aspects of only the planets! What about the Rashis? This factor was taken into account by Jaimini. He established that the rashis also aspected each other and the planets placed in them also coast their Aspects along with their respective rashis. These aspects are quite different from Parashari aspects. Apart from these main features Jaimini has its own Yogas, Argalas and dashas. The most popular dasha for General use is Char dasha. Some of the other dashas as are Sthir dasha, Mandook dasha, Trikona dasha, Nirayan shoola dasha, Brahma dasha, Varnada dasha and Yogardha dasha. Some of them are conditional dashas while the others are used for a specific purpose. We shall be confining ourselves to Char dasha only in this book. On the face of it, it may appear that Jaimini contradicts Parashar. This is a misconception. 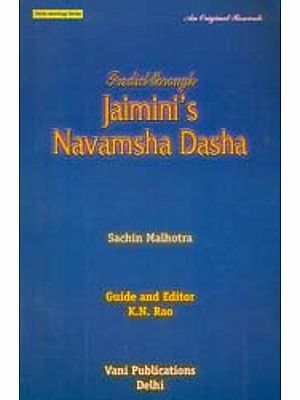 If studied in-depth, it becomes clear that Jaimini is only a refinement of Parashari principles. Traditional Astrologers mostly use Jaimini for ‘Ayurdaya’ or assessment of longevity. The time is ripe for us to make an effort to revive this great system, so that it can be used for the entire reading of the horoscope and for bringing fineness or sookshmata in prediction. 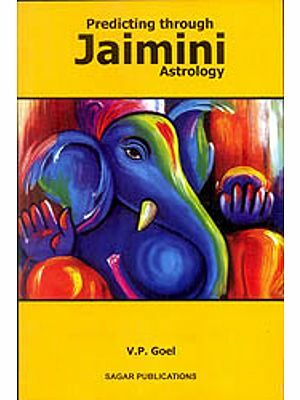 The main purpose behind introducing Jaimini Astrology is to encourage the use of composite techniques of prediction. These have been adopted superbly by shri Mahadeva pathak in his Jatak Tatva. He has used Jaimini principles alongside the Parashari principles to produce very good composite Techniques. In the end I would like to point out that most of the Astrological classical stress more on Negativity. As modern Astrologers we need to conduct researches to bring out the positive aspects of these principles and to modify and update them.